These are the meditations that helped me fully conquer my own arthritis. They retrained my response to pain, they provided deep physical, emotional, mental and spiritual healing. Once the deep root causes of my arthritis were gone, my arthritis disappeared. 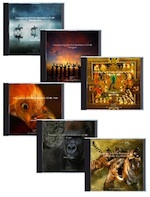 Click here is you would like to listen to MP3 previews or purchase MP3 downloads instead of physical CDs. CD #1 explains everything you need to get started, even if you have never meditated before. to release deep underlying causes of arthritis. CD #2 teaches an ancient Tibetan form of meditation called Tonglen that provided my first profound relief from can't-sleep-at-night, just-want-to-scream levels of pain. 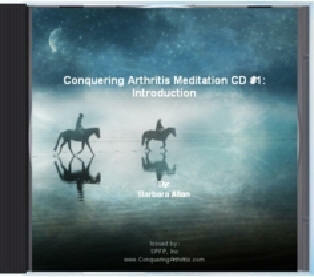 CD #3 teaches two highly effective meditations for dealing with and breaking through that hallmark of arthritis: physical pain. 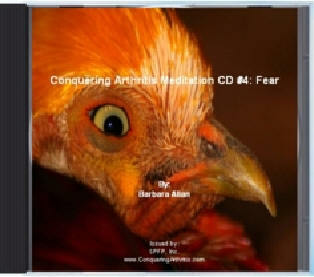 CD #4 focuses on meditations for identifying and releasing deep-seated fear. CD #5 teaches a special meditation for identifying and releasing deep-seated anger, anger so deep you may not even consciously know you are holding it in your body. CD #6 takes you through a special meditation for releasing resentment and bitterness. 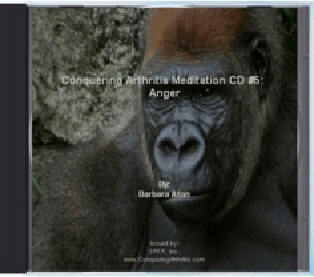 Each of these guided meditation CDs is designed to help you bring about profound healing of arthritis. Used together they help release deep blocks that underlie arthritis. Learning these skills can unlock deep reservoirs of healing potential you may never have known you possess. The Special Reports are all in Adobe PDF format. click on this icon to download it free from Adobe. Are you yearning for complete relaxation and inner peace? Then visit the world's most comprehensive guided meditation website where you can learn how to meditate for free, enjoy meditation music, and experience the bliss of guided imagery meditation.